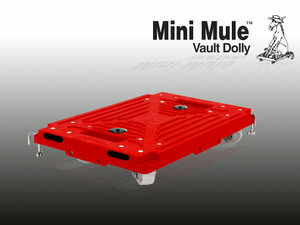 This four-wheeled flatbed dolly weighs only 5 lbs. but has a weight capacity of 250 lbs.! Constructed of robust glass-filled nylon with reinforced ribs for increased structural strength and impact rigidity. Beverage cases and 24-packs fit perfectly across flatbed for maximum storage capacity, and rubber grips help prevent the load from shifting during transport. 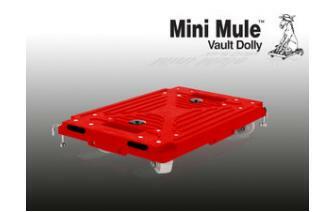 Heavy duty full-rotation castors enable large movable displays and unique in-store layouts. One and two-piece handle sets are also available to effortlessly transport dollies throughout a beverage cooler or retail store. 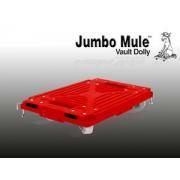 Solid steel J-hooks easily connect to other ADCO dollies in this line, to provide a complete, portable storage system with multiple configurations. 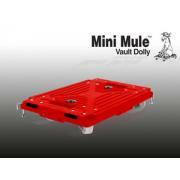 ADCO mini-mules offer easy mobility and quick access to product inventory, improving in-store efficiency and reducing injuries related to heavy lifting. Price is for each unit.